After a warm fall across the Great Lakes region, it's no surprise that the lake water temperatures are running above average this late in the year. The image below shows the surface water temperatures as of December 7, 2015. Other than the extreme northwestern corner of Lake Superior, no area of water has neared the freezing mark. In fact The Great Lakes are running an average of 2.88oF above normal based on the average from 1992 to 2014. 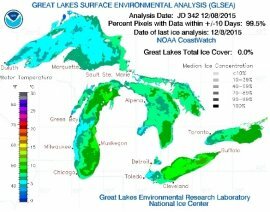 The graphic below also analyzes ice coverage, and highlights that there's no ice coverage across any of the Great Lakes. The two maps below show the same analysis for December 7, 2014 and the last for 2013. Both 2013 and 2014 were running near seasonal, with 2014 actually running just a smidgen below normal with a little over 1 per cent ice coverage - for early December, this is near normal. That being said, if we look at the figure below showing the maximum ice coverage from 1973 through this year, we can see that 2014 saw some of the highest ice concentrations on record, with January 2015 to the end of last winter not too far off. 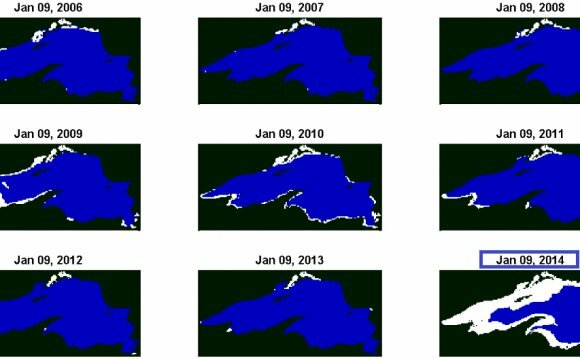 Given the current situation, the Great Lakes are on trend to see below normal lake ice coverage through the early half of this winter. While cooler temperatures are expected during mid to late December across much of the Great Lakes basin, it’s not likely to be cold enough or long enough to get the lake temperatures near freezing, with the exception being the western shoreline regions of Lake Superior. I suspect these regions could start to see some new ice near mid to late December, but nothing substantial as of yet.